In international peacekeeping and peace enforcement operations, asymmetric threats pose the principal danger to the Bundeswehr and its allies. Security sweeps by mobile elements and the need to protect convoys used for moving troops and supplies are the order of the day in deployed operations. During situations like these, ambushes by lightly armed insurgents and sniper fire – whether in urban environments or open terrain, often from semi-concealed positions or from above – constitute a clear and present danger to vehicle crews and dismounted troops in the vicinity of vehicles. Able to pinpoint threats, acoustic reconnaissance is an important capability for warding off attacks of this kind. Acoustic reconnaissance components significantly enhance the survivability and operational effectiveness of command, mission-specific and combat vehicles deployed in high-threat environments. This led Rheinmetall to develop the Acoustic Shooter Locating System (ASLS), a first basic version of which is now ready for the market. 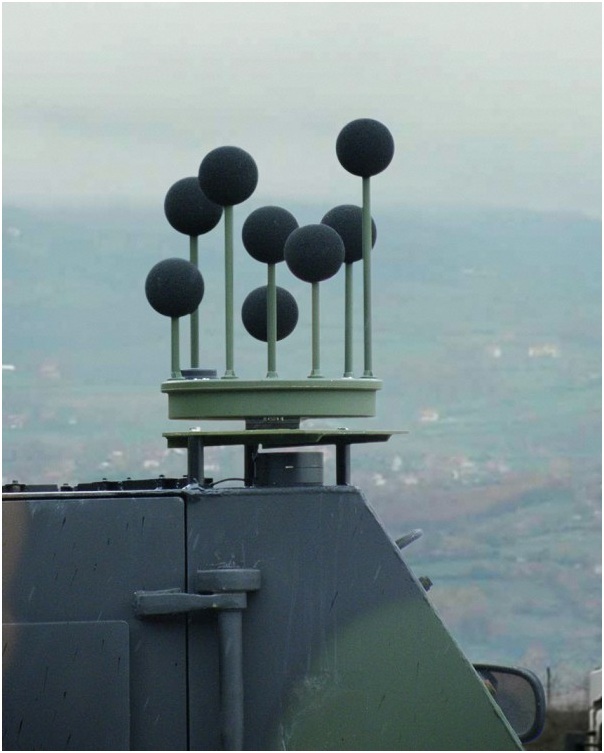 The ASLS basic version comprises a powerful acoustic sensor platform (microphone antenna) with integrated analysis electronics as well as a control and display device inside the vehicle. C4I systems, e.g. for target assignment and subsequent engagement. The microphones feature an extensive dynamic operating range, meaning that they reliably register loud artillery fire as well as less noisy muzzle blasts. The optimized microphone antennas and robust signal analysis procedure enable precise location of the shooter, with complete coverage of the surrounding terrain and a low false alarm rate even in the disrupted zone around the vehicle. Integrated position sensors compensate for the movement of the vehicle, meaning that the shooter’s position on the control and display device can be precisely located even when the vehicle is on the move. Furthermore, the display incorporates a history feature that enables ready access to recent events. An easy-to-use menu enables intuitive operation of the ASLS after minimal instruction. Designed for compactness, the ASLS is characterized by low weight and low power consumption (less than two watts). The basic configuration of the ASLS now available is designed for maximum flexibility. A quick mounting device eliminates the need for a vehicle-specific installation kit. This means that the system can be mounted in less than 15 minutes even in small vehicles with very little effort. The analysis electronics and battery pack are both integrated into the antenna base, enabling the system to operate without being connected to the vehicle’s central power supply. The analysis results can be transmitted to the control and display device either by wireless link or cable. The ASLS’s modularity assures high growth potential. Numerous enhancements and integration solutions in higher-echelon system environments are currently being examined under the rubric of future technologies.